Ronin Taiko – a theatrical Japanese drumming troupe – presents an engaging half-hour performance on the campus of Florida Tech! In Japan, the Taiko or Japanese traditional drum, carries a special significance. Used in religious ceremonies, wartime and in celebrations, the taiko’s powerful sound can also reach people at a personal level – often compared to a reflection of one’s own heartbeat. 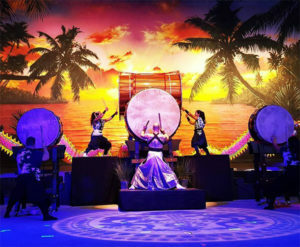 Ronin Taiko continues to bring Japanese Taiko performances to wider audiences.